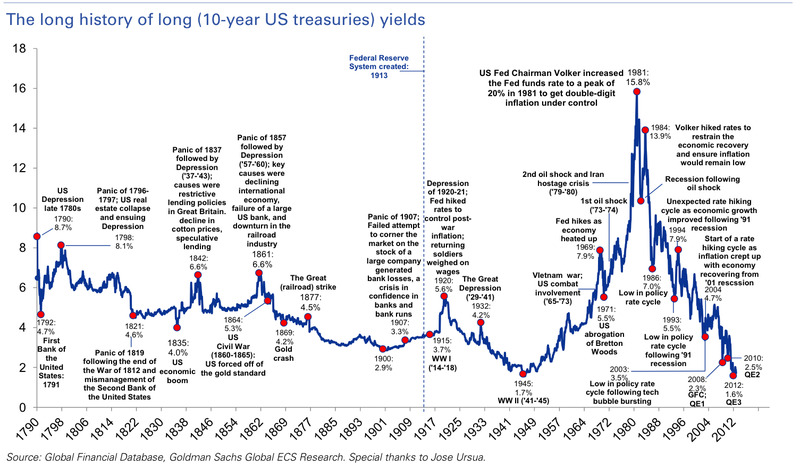 Back in 1981, the year I graduated from high school, the yield on 10-year Treasuries topped out at 15.8%. My entire adult life has consisted of a roaring bull market in bonds with steadily falling yields and rising prices. I’m now paying very close attention to what’s happening in the bond market and here’s why: Over the past 223 years of US interest rate history we know that bond bull markets tend to last between 22 and 37 years and the interest rate on the US 10-year Treasury note averages around 6%. The current bull market is now 32 years old and the 10-year note is yielding 1.9%. US bonds seem to be at a generational tipping point. However, a study of past bond cycles also tells us that rates can stay low for years before heading higher. 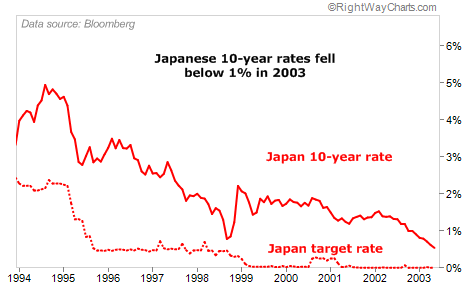 Japan is a good example: In 1996 policymakers cut rates to near-zero and today that country’s interest rates are still under 1% – 17 years later. I track three categories of US bond funds each market day for my newsletter and managed account program: taxable bonds, municipal bonds and high-yielding bonds. Taking a look at my six-month chart, you can see how taxable bonds [my proxy: iShares Core Total US Bond Market (AGG)] and municipal bonds [my proxy: iShares S&P National AMT-Free Muni Bond (MUB)] are languishing. High yield bond funds [my proxy: iShares iBoxx $ High Yield Corporate Bd (HYG)], however, have climbed nearly 8.5%. That’s quite a divergence. High yield bonds are performing relatively well now and when the tide turns against the bond market, they should continue to stand-out because unlike traditional bonds, high yield bonds aren’t terribly sensitive to rising interest rates. In fact, they can at times be negatively correlated to rising rates because when interest rates increase, it’s signalling a pickup in economic activity which can be beneficial to the companies who issued the high yield debt. Investment banker Barclays recently published fresh analysis on this subject which confirms that a rising rate environment poses relatively little threat to high yield bonds. Their study showed that high yield bonds avoided negative returns in 12 of 13 periods of rate increases. In other words, US high yield bonds march to the beat of their own drummer. 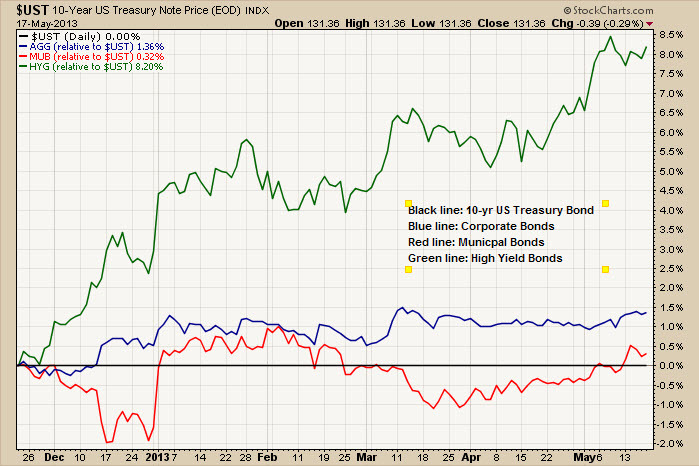 For now, my readings: US Bonds – Bearish, US Municipal Bonds – Bearish, US High Yield Bonds – Bullish.